Artisanship is my calling. My bows have received five Gold Medals and four Certificates of Merit from The Violin Society of America from 2004 through 2008. In 2008, I was awarded the prestigious honor of Hors Concours by the VSA. In 2016, I was asked to judge in two international bow making competitions: The Violin Society of America and Darling Publications' First International Competition. My passion is to create bows by hand. 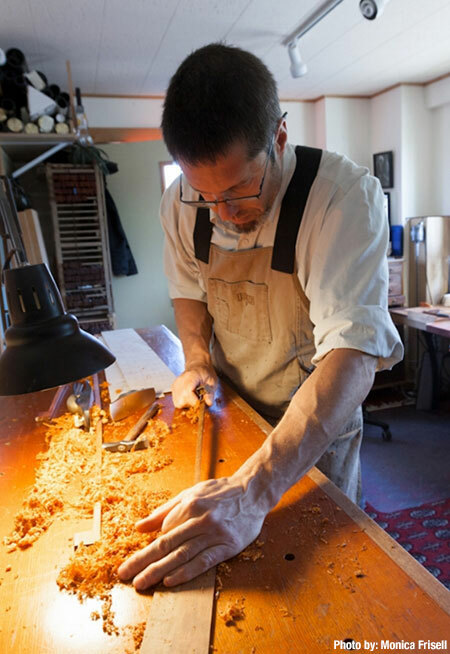 My work has been documented in several publications including "The Smithsonian,” "National Geographic," "The Strad," and “Strings," and most recently in, “Great Contemporary Bow Makers from the 21st Century, Vol II.” You can find more in the “Press” section of this website. Prior to bow making, I served an apprenticeship in the sculptural and two-dimensional art of the first peoples of the northwest coast of North America. The study of northwest coast native artwork and design gave me a strong foundation in tool skills and developed my eye for a beautiful line. In 2001, I began an apprenticeship with Charles Espey. This training provided a strong foundation in both the French method of bow making, and the history and style of French bows. Training with Mr. Espey was both rigorous and rewarding, and I am very grateful to him for his generous and committed instruction. Subsequent to completing my eighteen month apprenticeship, I established my own bow shop in Port Townsend, Washington. Bows of the violin family are created with rare and precious materials, using ancient tools and methods. To earn a livelihood as an archetier is a privilege. My responsibility is to honor the tradition of the craft and to always do my finest work. I am grateful to musicians the world over who have chosen my bows to express their passion!